With the fair weather comes the impulse, desire, need to plant a vegetable garden. High on everyone's list is tomatoes because home grown are manna from heaven. Around here you can find dozens of varieties, especially if you go to the farmers markets. These are only a handful of varieties offered by Kassenhoff Growers which are sold through garden centers and local farmers markets. Linked to ABC Wednesday. A farmer's market opens every Sunday in the local DMV parking lot. Much to my surprise, a creek flows through much of this property before it goes underground again. I'm guessing it's Temescal Creek which gives its name to the neighborhood. It's always a pleasure to see creeks surface in their run from hills to bay. This vegan restaurant on the Oakland-Emeryville border has this unusual mural as part of their advertising. It always makes me think of Invasion of the Body Snatchers and pod people. Probably not the association they were hoping for. Haven't tried this place so can't comment on the food. But I do see a lot of people sitting on the terrace at lunch time. 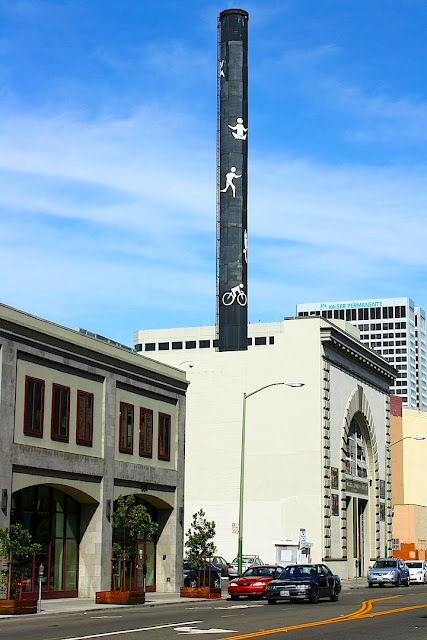 The white building with the smoke stack was originally the Great Western Power Company, a steam generation plant in the 20s. The operation shut down in the 30s and most recently has been converted into a huge gym. Along with standard workouts they offer yoga and rock and rope climbing classes. The smoke stack figures catch the eye for blocks around. The cirrus clouds are common in the late afternoon. Linked to Skywatch Friday. Remember the octopus mural on the apartment building? This one is around the corner. Lots to look at here. Sadly, I couldn't find a signature. 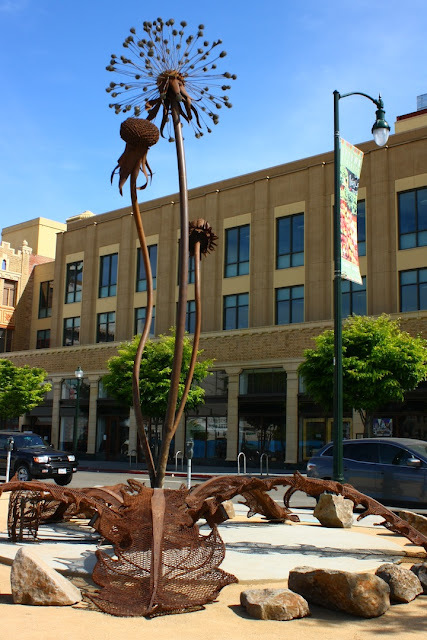 Recently Oakland created a temporary sculpture display in the Uptown area. 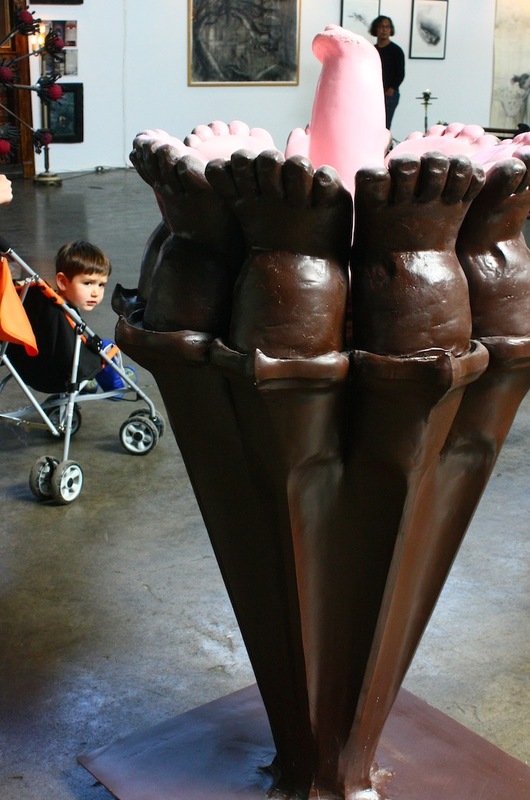 This giant flower is by Karen Cusolito who runs the American Steel studios. 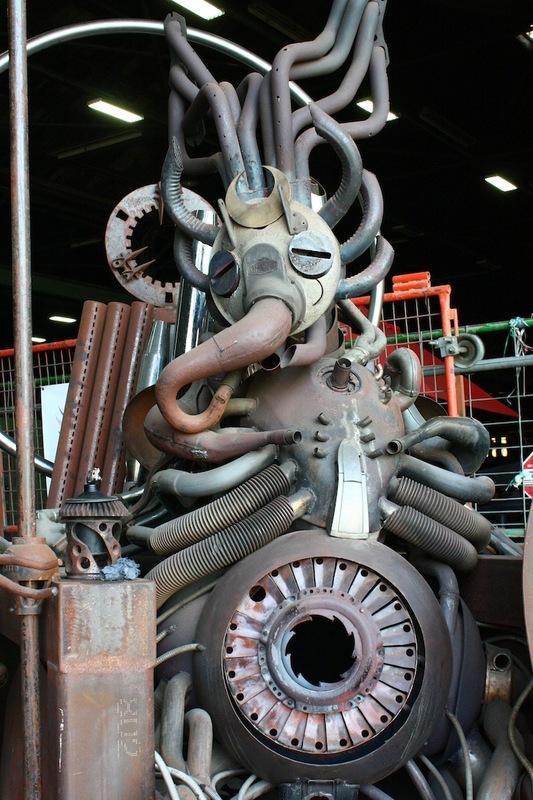 Her giant creations are often seen at Burning Man. This piece is at least 10 feet tall and reaches to the blue skies that appear in the afternoon after the "marine layer" burns off. Linked to Skywatch Friday. The American Steel studios held an open house this past Saturday. This little boy found a piece he could sit in and move some of the parts. His papa was happily taking pictures of him so I did too. Linked to ABC Wednesday. This is part of a mural sequence at the entrance to the American Steel artist collective in West Oakland. They held an open house yesterday which was a good opportunity to see the wide variety of artistic projects housed in this former steel factory. For the uninitiated this is a scene of a Bart train (our metro) flying off the tracks and becoming airborne. I don't know what it means but it made me laugh. And they're serious about No Smoking. The warehouse is full of stuff that will go boom if exposed to a flame. We seem to have lots of old vintage signs in Oakland. This one is for a flower shop that has been in business in this location for more than 60 years just outside the gates of Mt. 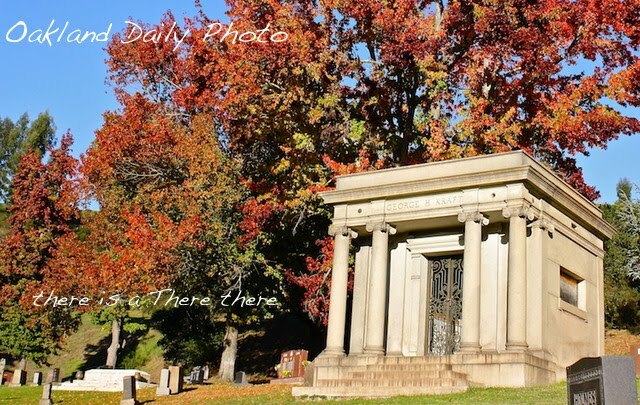 View Cemetery. The sign looks in tact but I don't think I've ever seen it lighted up. 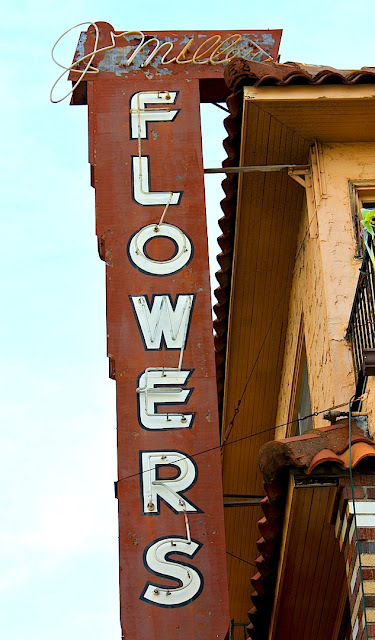 I've seen other flower shop signs in much the same style around town which makes me think it was a stock design. The slightly murky sky is what we are experiencing these past few days after the heat wave broke. It's overcast in the morning and sometimes the sun comes out in the afternoon, sometimes not. Linked to Skywatch Friday. People's Grocery located in West Oakland is dedicated to bringing wholesome food to the local community where grocery stores are typically limited to corner stores. They also grow some of the produce they sell. This plot is next to their store on 7th Street. I'm sorry that I don't know who did this entrancing mural that graces the side of the store. 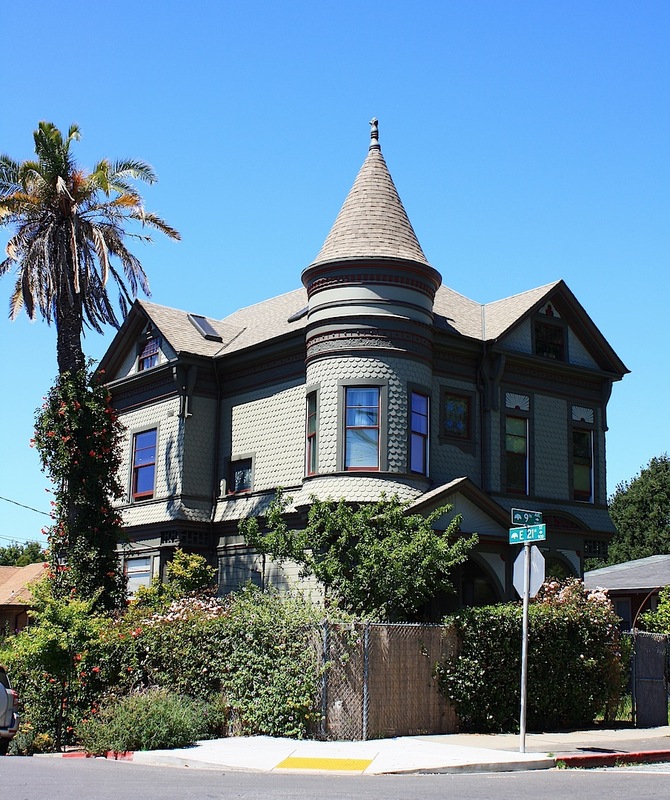 Oakland has a multitude of Victorian houses that survived the 1906 earthquake. This lovely Queen Ann with fish scale shingles is on Ivy Hill. You saw another shot of Ivy Hill last week. Not only is the weather fair, and the skies clear, we've also been having a heat wave accompanied by warm easterly winds. Not a good combination in fire season. It's supposed to cool down tonight with a return to our typical, cool westerly winds. Fingers crossed. Linked to Skywatch Friday. The tools of a wood sculptor who was presenting a demonstration at the Oakland Museum. 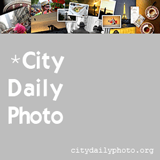 Visit City Daily Photo's monthly theme day link to view interpretations of this theme from around the world.